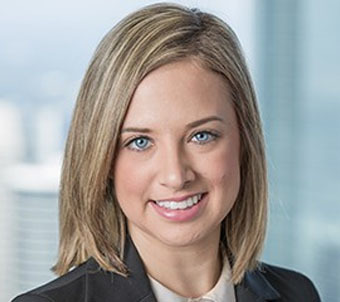 Kristin Leveille is an associate in the Houston office of McKool Smith. Kristin focuses her practice on complex commercial and business litigation. She also litigates cross-border and bankruptcy disputes. Prior to joining McKool Smith, she was a judicial intern for the Honorable Sim Lake and the Honorable Jeff Bohm in the U.S. District Court for the Southern District of Texas. During law school, Kristin served as a senior articles editor for the Houston Law Review, where she earned an award for Best Paper in the area of Corporate, Securities, or Business Law. Kristin also participated as a finalist in the 20th Annual Honorable Conrad B. Duberstein Bankruptcy Moot Court Competition, where she earned an award for outstanding brief writing. Served as lead associate representing an equipment manufacturer against its dealer's wrongful termination lawsuit in the Eastern District of Michigan. Drafted and argued Rule 12(b)(6) Motion to Dismiss that resulted in dismissal of the dealer's tort claims. Represented a group of oil and gas interest owners in a lawsuit over the sale of oil and gas properties in the Texas Panhandle. Performed extensive legal research, drafted dispositive motions pertaining to the measure of damages, and drafted multiple Daubert/Robinson motions. Resulted in a take-nothing judgment of all claims against the clients. Represented an oil and gas operator in a three-week jury trial against the manufacturer of oilfield connections that resulted in a $3 million verdict for the client. Drafted pre-trial motions—including Daubert/Robinson motions—motions to strike evidence, trial briefs, and managed trial exhibits. Drafted key motion on the admissibility of similar incidents that was granted in full.